Spectrum King is the first company to provide Full Spectrum LED grow lights to both the commercial and home growing community. 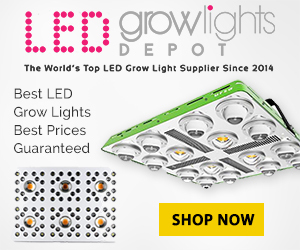 We design our LED grow lights to mimic the sunlight because that is what plants need. Unlike other LED grow lights, SKLED distances their competitors by having one of the largest PAR ranges, as well as high lumens count. Plants need more than just ultraviolet or red light; they need the Full Spectrum of colors for their grow cycle (including Blues, Reds, etc.). Unlike other grow lights and bulbs, Spectrum King’s full spectrum grow lights supply the plants all light they need. Also, they do not get hot (saving money on both AC and maintenance), while protecting the environment from pollution. If you grow with HPS grow lights (an old technology), you know how much money must be allocated to your electricity bills! When you change to Spectrum King LED lights, you will get higher yields for less expense, whether you are a commercial or home grower. When you choose to grow with inexpensive/lower quality LED grow lights, or even ONE color LED grow light you will notice the difference when you change to Spectrum King LED and get much better yields in your commercial and home grows.